With the release of the BLS’ “The Employment Situation – June 2013” report just days away, many economists anticipated the nation’s recent job growth trends would continue. After all, the national unemployment rate had contracted to 7.5 percent in April, the lowest rate recorded since December 2008, as an average of 195,750 jobs had been generated per month since January. Most economists’ projections were a bit lower than 2013’s monthly job creation average, typically ranging from 160,000 to 170,000 but they were virtually accurate. 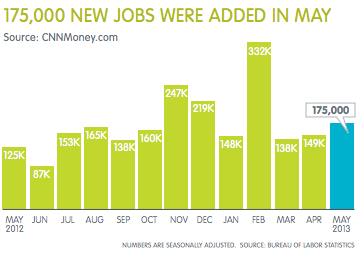 According to June’s employment report, 175,000 new jobs were added to the national economy last month. The civilian labor force also grew, by 420,000, rising to 155.7 million. The national unemployment rate rose slightly to 7.6 percent with. many economists noting this rise in unemployment is actually encouraging, signifying that Americans’ confidence in the marketplace is improving, as the nation’s unemployed are beginning to look for jobs once more and are considering themselves active participants in the job market. As further proof of economic recovery, the total number of Americans pursuing unemployment benefits recently declined, falling to 346,000 during the last week of May, a decrease of 11,000. This contraction was likely directly associated with the private sector, which continues to hire at a steady pace. Since January, 972,000 private sector jobs have been added to the national economy, according to Alan Krueger, chairman of the Council of Economic Advisers. In all, 11.8 million Americans are unemployed. 780,000 are considered discouraged workers, as they have given up on their job searches for the time being, lacking confidence in the job market. And 7.9 million Americans are presently working part-time for economic reasons. With private sector employment steadily rising, and the majority of sectors showing long term gain in 2013, it is a hopeful sign that economic recovery is continuing. According to some economists’ estimates, at least 200,000 new jobs need to be created per month, on average, in order to significantly lower the United States’ national unemployment rate, which is still well above the norm. Although last month’s total job creation did not exceed 200,000, economists were still encouraged by its findings, particularly with regards to private sector employment, which increased for the 39th consecutive month. Nearly 113.8 million professionals were employed within the private sector in May, as hiring was wide-ranging, rising by 178,000. In particular, the following industries reported solid job gains. Accounting and Bookkeeping Services: Last month, roughly 940,100 professionals were employed within the industry, as 3,100 new jobs were added to the national economy. Since May 2012, employment has risen by 26,500. Healthcare: Although hiring was not as prevalent as in recent months, the sector still reported solid employment gains in May, as 10,700 new jobs were created. To compare, an average of 22,433 new jobs have been generated per month since May 2012.
Leisure and Hospitality: For the second straight month, 43,000 professionals were hired within the sector. Unsurprisingly, food services and drinking places employment remained robust, as 38,100 workers accepted job offers. Professional and Business Services: Sector employment continued to augment last month, as hiring rose by 57,000. Known for its steady job growth patterns, the sector employed nearly 18.5 million professionals in May, a growth of nearly 600,000 jobs since last year. Retail Trade: A majority of retailers reported job gains in May, as 27,700 professionals were hired. In all, 15.1 million professionals were employed within the sector. Temporary Help Services: Since stalling in December 2012 and January 2013, sector hiring has steadily risen ever since. Last month, 25,600 professionals were added to payrolls, as total sector employment rose to approximately 2.7 million. Suddath Global Logistics LLC (SGL), headquartered in Jacksonville, Florida, announces the acquisition of PenserSC, a third party logistics (3PL) company that provides warehousing and logistics services. In line with Suddath’s strategic growth initiatives, this combination strengthens the company’s global supply chain management service portfolio. The acquisition of PenserSC further enhances our ability to support customers who need a full menu of logistics services for their distribution center and manufacturing activities, said Barry S. Vaughn, chief executive officer of The Suddath Companies. This is the second acquisition for our logistics division over the past six months, which demonstrates our commitment to strategic expansion in an effort to best serve our ever growing global customer base. Friday’s employment report for May was just down the middle. On Friday morning at 6:00 am, the NYT posted an article titled, “Wall Street’s Ideal Jobs Gain: Middling.” I was quoted in it saying that the market would be happy à la Goldilocks with any payroll number between 100,000 and 200,000. The gain was 175,000. The result was Goldilocks on steroids. The stock market tends to do best when investors are least concerned about the prospects of a recession. Friday’s numbers were reassuring because our YRI Earned Income Proxy rose to yet another record high. We derive it simply by multiplying aggregate weekly hours times average hourly earnings of total private industries times 52. 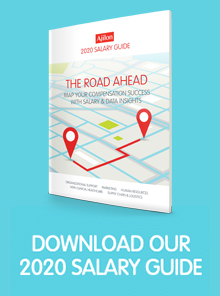 It is highly correlated with wages and salaries in personal income and with retail sales.